58 – I Never Thought …..
It’s the end of May. How much has changed in the past year. In May last year I was busy with my freelance work, preparing training courses to help charities in Devon and elsewhere to improve their fundraising skills by writing better funding applications, and training Trustees of charities working with prisoners and ex-offenders. Diary full of commitments. In May last year I was viewing properties in Spain, able to buy if I found just the right thing, but with no pressure so to do – I could do more visits to different areas until the right home came along. In May last year I was driving up the A30 to Salisbury Hospital every day to see my mother. Only a year ago. A whole lifetime ago. I never thought I’d retire. I used to think “Even if I won the Lottery, I’d still work, helping charities achieve their objectives.” Turns out I didn’t know myself as well as I thought I did. Though perhaps I did – I still get requests to look at final draft funding applications or draft constitutions. Sometimes I say yes, and do it pro bono. Not always. If there’s time. There often isn’t – life after early retirement is full to over-flowing. Never thought of me, retired. I never thought I’d buy the second house I viewed. Others go on a dozen house-hunting trips, first narrowing down the area, then viewing twenty or more houses. I’d only been to Colmenar once before. Liked it, hadn’t yet fallen in love with it. There was no rush to buy. I’d saved up over the previous ten years, had a budget, could buy if I wanted but no pressure. Mum had nudged me to go on a house-hunting trip. Saw four, bought the second. Never thought I’d buy on that first trip. Never thought I’d find my new home. Never thought mum would die. We only went in for a chest X-ray. “Bit of fluid on the lung” said the doctor, “we’ll keep her in a couple of nights.” Three weeks later, transfer out of Salisbury Hospital to our little community hospital in Shaftesbury. When I arrived, an hour after her, the nurses looked at me with kindness and with pity. They knew. Never thought mum would die. Early stages of Alzheimer’s, she had. And a bit of fluid on the lung. We’d had our regular Sunday Scrabble game just a few weeks before. But at the little hospital – they knew. Twenty-two years after she gave up smoking, it got her. 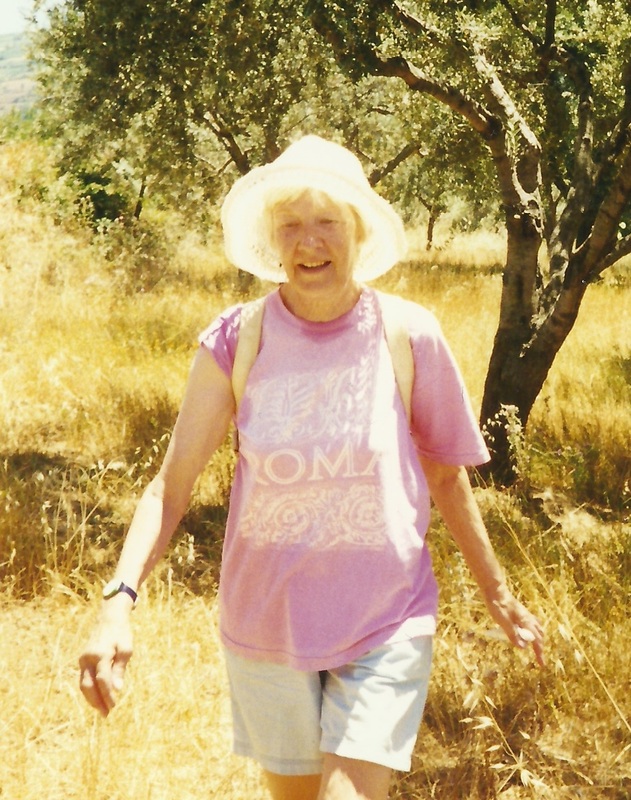 We’d celebrated her giving up, aged 60, by walking the Dales Way. Ilkley to Windermere – a lovely week. So she never did have Alzheimer’s. The massive, creeping, secondary tumour in her brain was just squeezing out the memories. Control, Alt, Delete. One by one it pushed out random memories and slivers of personality. Never thought mum would die. She was meant to come home after the X-ray, then after they drained the fluid. But there was that look on the face of the nurses. “Poor Tamara” their faces said. I’m invited into the GP’s office. He gives it the name. The one nobody wants to hear. Scarier than Alzheimer’s. Scarier than fluid on the lung. Found so late, she only has a few days left. All around Shaftesbury bunting is everywhere, all around the country royal fever is at its height. Diamond Jubilee weekend. “You’ve got a house, haven’t you? A home in Spain?” she asked me, urgently. “Yes mum, a lovely house.” “Good,” she said, “You’ll be fine.” Rare coherence. It seemed to be important to her. Never thought that mum would die. It changes everything. Everything is different now. Most of it is good. Very good. Some of it can’t ever be fixed. This entry was posted in Dorset, Spain and tagged cancer, Colmenar, Dorset, Mum, Shaftesbury, SpanishBlog by tamaraessex. Bookmark the permalink. Beautifully written, made me weep; must have been hard for you to write. Keeping our loved ones’ memories alive is so important – thank you for sharing your Mum with us. So sad to hear about your mother, Tamara. Reading your post, though, reminded me what I admire in you as a blogger the most. Your searing honesty. Pure empathy, Tamara, will strike a chord with anyone who’s lost their Mum (me, last year). I still talk to mine regularly – and argue with her – usually when I’m going to light up a fag because I can hear her saying ‘don’t’! She’ll only really die when I do! Oh Alison aren’t you lucky to have had such a great relationship with your mum, just as I did with mine? So May last year was a tough one for you too 😦 I’m so glad your mum got that last visit in to your home – and I’m thinking of you as you, too, go through that difficult list of “first Christmas”, “first this, first that” without your beloved mum. Thanks everyone. Belinda – “She’ll only really die when I do” – what a super thought, that’s very comforting, thank you. All of you – thank you for sharing what you’ve been through and are going through. It’s universal, isn’t it? And unique all at the same time. Such a moving post, thank you so much for sharing your journey. I’m lucky enough to still have my mum, but am acutely aware of valuing every moment with her. May you continue to grow and thrive and help to perpetuate her spirit through your own zest for life and creativity. Great post Tamara, written with love, integrity and style. I moved to Spain (Salobrena) after both my parents died within a short time of each other. Still miss them despite my gorgeous daughters (now 9 and 7) that were born here. They will never know their grandparents but I hope they get a sense of them through having me as their mum. Just got back from Spain and now reading your posts. Well written and so, so poignant. Its been a tough year for so many but just like Belinda I know that the ones we’ve lost will live as long as those of us we loved them do! so very sorry for your loss Nikky.x Thinking of you. It was very moving to read about your mum Tamara. I hope every day is easier than the last. It’s true that she lives on through you. This was the 7th xmas withoutmy mum… the tears still come naturally, It is 22 years since dad died ….just like yesterday .We never expect them to die even though we know they willone day .You let her go in peace, happy that you would be able to get depaysee(i dont know how to find acutes) and live on happy.YOUR LOVE AND tenderness with which you write about your mum is beautiful.You were a special person when we were in high school and you still are,Tamara!